Readers, meet the Chinese equivalent of chimichurri: my beloved Ginger & Scallion sauce. It is most commonly served with a plain steamed chicken, but I enjoy it so much that I can easily eat it with just a bowl of white rice and a fried egg on top. Noms. This sauce has such great flavors that even Momofuku's David Chang features it as one of the four sauces he uses to accompany his large format meals like the Bo Ssam at Ssäm Bar and Fried Chicken at Noodle Bar. 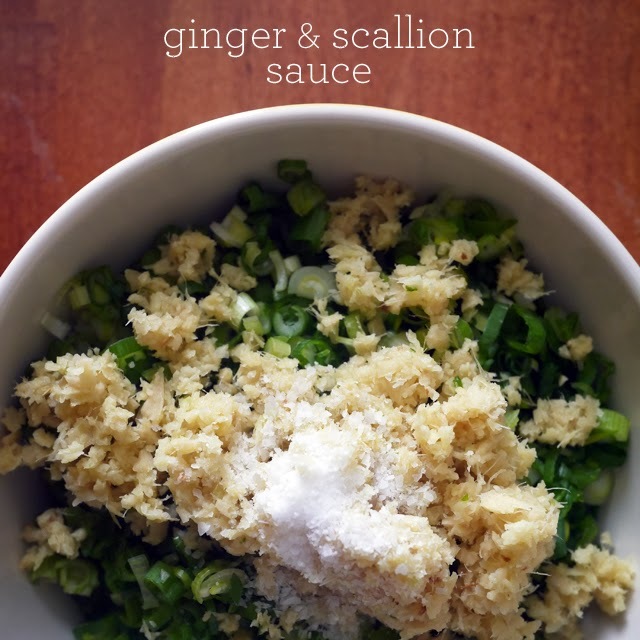 This simple sauce is made with a few key ingredients: finely sliced scallion, minced ginger, salt and scalding hot oil to pour over the aromatics to bring out the sweetness of the scallions. Sure, you can be like Chang and add some soy sauce and sherry vinegar too, but I am a purest and like it the way my family has always prepared it. Do note that we blended the ginger to quickly mince it, but I would never add the scallions to the blender. The scallions needs a bit of bite to it and not be straight up mush. You honestly can eat this with almost anything. Try it next time when you want to add a different flavor profile to your meats, tofu, noodles, when you make a homemade Bo Ssäm (recipe to come) or heck, eat it with your bowl of white rice like I do! 1. Mix ginger, scallion and salt in bowl. 2. Heat oil. In a small saucepan, heat up the neutral flavored oil in medium high heat. Once hot, pour over mixture and make sure the scallions are cooked a little bit by the hot oil. Stir, let sit for 14-30 minutes and serve. You can use the sauce right away or you can even keep it in the fridge for 2-3 days to use later.